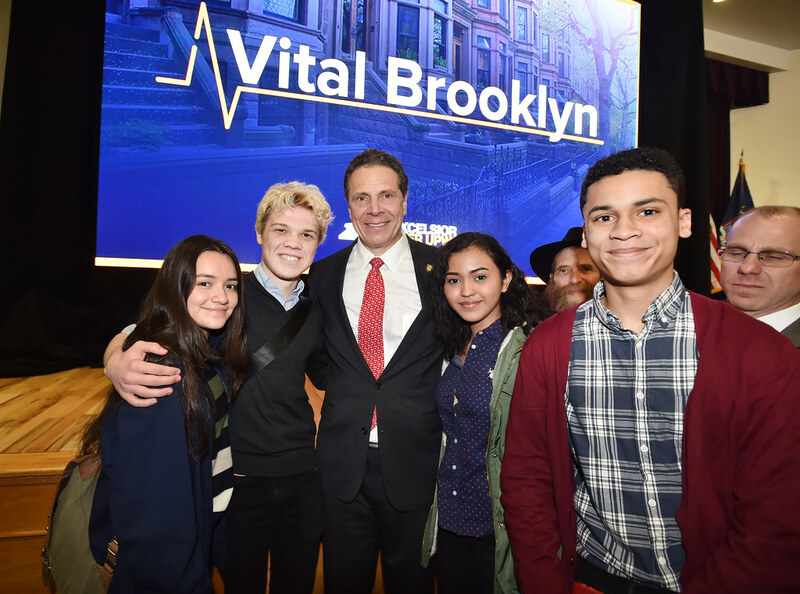 Governor Andrew M. Cuomo today announced the $1.4 billion Vital Brooklyn initiative that will transform the Central Brooklyn region. The groundbreaking proposal will target and invest in eight integrated areas, establishing a national paradigm for addressing chronic disparities, like systemic violence and entrenched poverty in high-need communities. Today, one in four Central Brooklynites are food insecure -- almost twice the state average -- meaning they lack access to quality and variety in their diet, leading to diabetes, obesity, and other health issues. While many communities throughout New York State have experienced an economic resurgence over the past six years, the recovery has been slower to reach Central Brooklyn with an unemployment rate almost three percentage points higher than the New York City rate. To break this trend and jumpstart growth in this community, Vital Brooklyn will give residents of all ages the resources they need for economic empowerment, including financial literacy, entrepreneurship and job training and placement programs. Every family deserves a safe and decent place to call home. Residents of Central Brooklyn pay approximately half of their total household income on rent alone -- compared to 32 percent of household income statewide. Vital Brooklyn will create new affordable housing opportunities that encourage active lifestyles and increase access to preventive care. Invest in sustainable practices, including renewable and redundant energy sources, energy efficiency and green jobs training. Senator Kevin Parker said, "I applaud Governor Cuomo for recognizing the urgent need in Central Brooklyn and responding with funded commitment to coordinate state services. This needs to be passed in this year's budget and when it does it is our aspiration that Vital Brooklyn will usher in a new era in our community that will be filled with and hope Opportunity." State Senator Jesse Hamilton said, "I welcome Governor Cuomo’s “Vital Brooklyn” initiative. This $1.4 billion investment will bolster the work of countless community institutions and neighborhood organizations seeking to meet the needs of Brooklynites. More truly affordable housing to tackle the housing crisis, violence prevention work to halt the anguish too many families face, action on public health to improve the wellness of our communities, investment in workforce development to pave the way for the careers of the future, and more. These investments vindicate the work of community partners who have been dedicated to tackling these challenges – innovators like those who partnered with me and my colleagues to establish the first tech and wellness hub at a public housing site in the United States in Brownsville last year, and only last week expanded that “Campus” initiative to Crown Heights. And these investments will allow us to realize the promise of a more affordable Brooklyn, a safer Brooklyn, and a more prosperous Brooklyn for all." Assemblymember Martiza Davila said, "Vulnerable New Yorkers are in dire need of supportive housing throughout the city and across the state. At a time when luxury high-rises are rapidly replacing the space occupied by the housing and services most needed by our seniors and families, it is a breath of fresh air to see a project so focused on the overall well-being of the community.​ We need this to be included in this year's state budget." Public Advocate for the City of New York Letitia James said, “One of the biggest challenges we face as a City is ensuring that we create and maintain healthy communities. This plan for Brooklyn communities will provide day-to-day resources ranging from affordable housing and healthy food options, to education, youth support, crime prevention, and career support. I applaud the Governor for his leadership in this effort and look forward to working with him to create a stronger, more sustainable New York for all." Brooklyn Borough President Eric Adams said, "Central Brooklyn neighborhoods have long struggled to emerge from cyclical patterns of poor health, poverty, and preventable violence. That struggle has been based largely in a systemic failure to invest in and support the hard-working men and women of these communities who are fighting every day to create safer places for their neighbors to raise healthy children and families. As a former police officer patrolling these streets, as well as a man who has fought against the same Type 2 diabetes diagnosis that imperils thousands of my constituents, I feel these struggles personally just as clearly as I see the hope for a brighter tomorrow. I commend the State for making this long-awaited investment in the health and wellness of central Brooklyn, and I hope to work in true partnership with Albany to ensure Vital Brooklyn is the vital success that all New Yorkers are counting on it to be." New York State Agriculture Commissioner Richard A. Ball said, “Vital Brooklyn will deliver innovative solutions to connect Brooklyn communities with affordable, sustainable wellness options. This program will increase access to fresh, local foods, including some of New York's quality produce, to help all residents lead a healthier, more sustainable lifestyle. These actions reflect the Governor's unparalleled commitment to bettering the Brooklyn community and I look forward to what this comprehensive approach will accomplish."